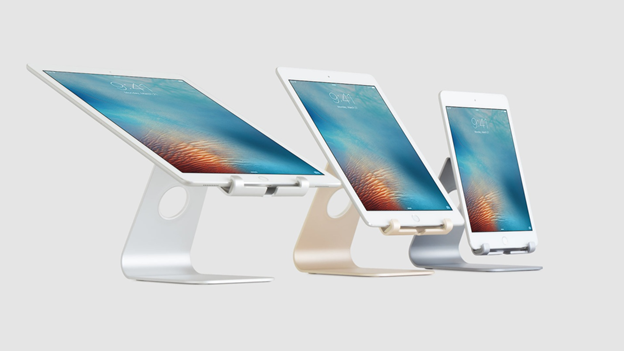 Rain Design's best selling mStand and mStand360 now come in 3 Apple matching colors: silver, gold and space gray. mStand transforms your notebook into a stylish and stable workstation so you can work comfortably and safely all day. The mStand360 has a swivel base that makes screen-sharing and accessing ports easy. It allows the user to safely turn the laptop without the pressure of weight. mStand tablet pro 9.7" and 12.9"
mStand tablet pro transforms your iPad Pro into a stylish and stable desktop, making complex work with touching, swiping or writing with a pencil easy. mStand tablet pro features adjustable viewing angle and height with a simple slide 'n' lock mechanism for personalized comfort and flexibility. 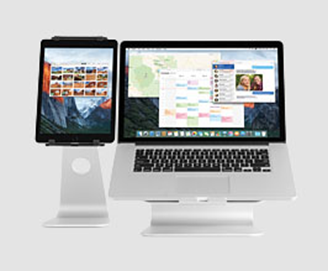 It can also be used as a second display when using a Macbook with a mStand laptop stand. mStabd tablet pro is available in silver, gold and space gray, and comes in 2 sizes: 9.7" and 12.9" for iPad Air/Pro 9.7" and iPad Pro 12.9", respectively. mStand mobile and tablet stands support your iPhone or iPad and free your hand, so you can work comfortably with touching, swiping, typing or simply enjoy a relaxing video chat. mStand tablet plus comes with the additional feature of adjustable viewing angle for optimal viewing comfort. 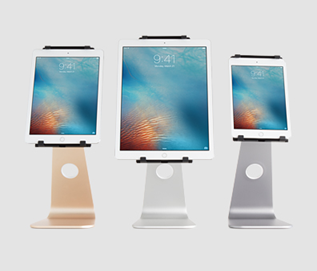 Made of a single solid piece of aluminum with matching iPad/iPhone's sand-blasted and anodized finish, the mStand mobile and tablet stands are available in silver, gold or space gray. Fits iPad and iPhone with or without Smart Cover/ Case. Rain Design mStand series shipping now. For more info: www.raindesigninc.com.